Dragon themed pokies are incredibly common, so when a software developer opts to release a title with this theme they need to offer something unique. Big Time Gaming have done just that with their 2016 pokie, Dragon Born, offering a whopping 117,649 ways to win – and it’s not a typo. Released in 2016, we take a look at the unique title and whether the huge number of ways to win really does pay off. Big Time Gaming are the first to release a pokie with this unique formatting and have been able to do so thanks to their very own system called MEGAWAYS. This system features 6 reels and seven windows (instead of rows) which can either be filled with single symbols or multiple symbols in one (up to seven). What’s more, there are Wild multipliers, of up to 7x for the one reel, added too. This allows for many winning combinations eligible to be formed, with symbols multiplied across the reels while adjacent symbols from left to right are multiplied too. The theme takes us to the to royal territory, featuring a backdrop of medieval lands – reminiscent of those we see in Game of Thrones – where Kings, Queens, Princesses, and Knights are situated in their kingdom. The minimum bet is set at $0.40 while the maximum bet is set at $80, and on each winning spin it will tell you how many ways you have won. But the huge amount of ways to win isn’t the only impressive feature – there are full Wild Reels and up to 50 free spins available to win too. But first we take a look at the symbols which trigger these features and their payouts. There is a total of 10 standard symbols on the reels (not including the Wild or Scatter). The lower symbols feature the standard 9 to A symbols but they all have their own symbol or character too including a cup (9), a shield (10, a Knight (J), a Queen (Q) a King (K), and a Princess (A). Score a minimum of three of the one symbol from left to right to earn a payout, with a maximum of six of the same from left to right offering you the best payout (for each symbol). The middle paying symbols include the Kingdom’s flag, the blue gem and the red gem. These all payout once you’ve landing three of the same from left to right, with six of the same offering the highest payout. The highest paying symbol is the Dragon, with a minimum of two symbols from left to right paying two coins, while a maximum of six symbols from left to right pays 50 coins. You can view the paytable for the rest of the payouts by clicking or tapping the three horizontal lines next to the stake size. Scatter: The Scatter symbol is the Diamond, and at least three will activate the Free Spins feature (see below). Full Reel Wild symbols: The Full Reel Wild symbol appears in the base game and, as its name suggests, takes up an entire reel. We detail its full function below. Wild: This Wild symbol features the text ‘Wild’ and only appears in the Free Spins bonus round. It can appear single or Stacked and substitutes for all symbols except the Scatter. Each symbol looks more magnificent the larger it grows, and the payouts are better too. Since we have already mentioned the MEGAWAYS system, offering 117,649 ways to win, we will stick to the in-game bonus features. The Full Reel Wild feature sees a whole reel (seven symbols) covered and substitutes for any symbol except the Scatter. It can also see up to a 7x multiplier applied when involved in winning combinations. Additionally, the more Full Reel Wilds which appear, the higher the multiplier, e.g. two Full Reel Wilds both offering 7x multipliers see a 49x multiplier applied on the winning combinations. Any additional Scatter symbols which appear during the Free Spins feature will score you one extra free spin too. 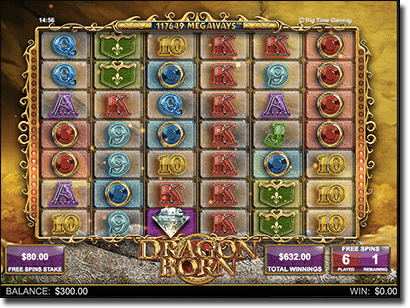 The huge number of ways to win in Dragon Born pokies is a drawcard it in itself, but the possibility to win up to 50 free spins too has our attention. The MEGAWAYS system means the number of ways to win varies – keeping us on our toes on every spin – while the additional multiplier thanks to the Full Reel Wild means we can get a huge payout just in the base game. The minimum bet is a bit higher than usual, but not as high as some 243 ways to win pokies are. 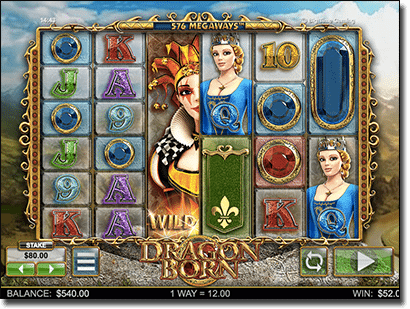 Dragon Born has also been optimised for the HTML5 platform meaning Apple, Android, Windows, and other smartphone and tablet users can try out the MEGAWAYS system on the go. Simply tap our links at the bottom of our page to get playing the mobile version of Dragon Born. Overall, we can’t recommend this unique title enough and you can definitely win big time on this pokie by Big Time Gaming. For more great online slot games, check out our list of online slot reviews.